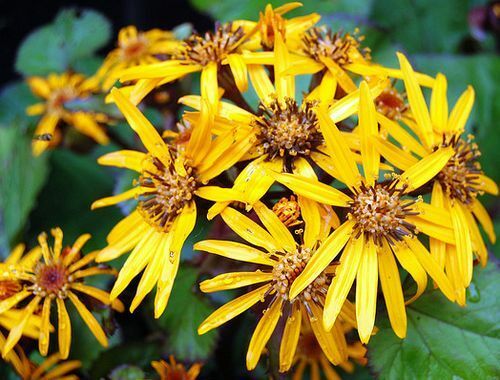 Members of Ligularia are hardy perennials that can reach from 30 cm to 1.8 m in height. They have tall stalks that grow out from large leaves. The Ligularia genus plants can produce two distinct types of flowers; either daisy like or as long racemes; these flowers are usually yellow in both cases and bloom in the summer. 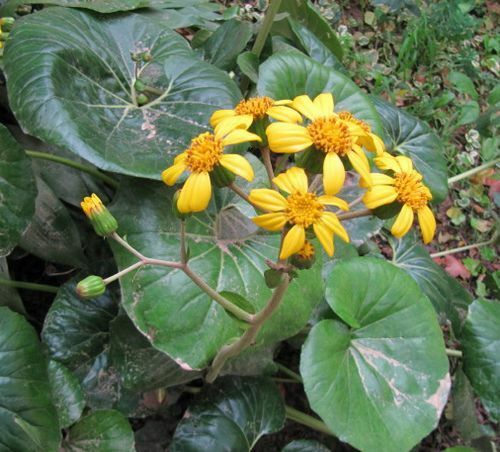 Some of the common names for Ligularia include Goldenray and Leopard plant. Common Names: Leopard Plant, Golden Groundsel, Golden Ray, Summer Ragwort. Height: 24 to 72 inches (60 to 180 cm). Flower Details: Yellow, orange. Stalks. Racemes. Daisy-like ray and disc florets. Foliage: Herbaceous. Leathery. Large. Kidney-shaped. Deeply cut. Green, purple. Sow Outside: Surface. Start of spring - before the last frost, or early in autumn. Spacing 24 to 36 inches (60 to 90 cm). Sow Inside: Germination time: two weeks to two months. Temperature: 55 to 65°F (13 to 18°C). Seven or eight weeks in advance. Transplant outdoors in the spring. Requirements and care: Full sunlight or partial shade in warmer areas. Moist soil, ordinary soil. Mix in organic matter when planting. Regular watering during dry periods. Spring mulch. Occasional feed in spring and summer. Tidy dead inflorescences. Cut back to the ground in autumn. Divide every three years to maintain vigour. Propagate: by dividing in the spring. Miscellaneous: Some species of Ligularia are used in traditional Chinese medicine as they have antibacterial properties. When growing Goldenray and other Ligularia outdoors from seeds they can be sown on the soil surface in either autumn or before the last frost of spring. They prefer to grow in sunny areas of the garden but are able to tolerate shady conditions. The soil that Ligularia grows in should be moist. When first growing Ligularia seedlings indoors then they should be prepared about one and a half months before due in the garden in the spring. They take from two to six weeks to germinate at 12 to 18 degrees. Ligularia are fairly easy to look after, requiring regular water to maintain moist soil and a fertilizer applied in spring and summer. After flowering has finished cut back the stalks. At the end of the growing season in autumn cut Ligularia plants to ground level. To maintain vigorous growth it is best to divide Ligularia every three years in the springtime (this also enables the propagation of more plants).